Oversized item, will ship via Curbside Freight Trucking, please allow 14 days time for delivery. Ship within 1-2 Business days. Lowest Price Guarantee. 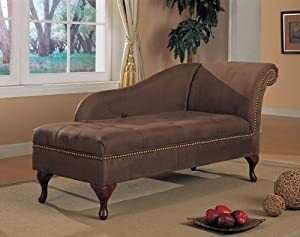 Brown Microfiber Chaise Lounger with Storage Space. This beautiful microfiber chaise lounger matches any decor in your home. Flip open seat for added storage space and adorned with nail head trim. Cherry finish legs. This is an oversize item. The shipping cost has included shipping, handling, and oversize fees. The merchandise will be shipped curbside only via professional LTL freight. Call AtHomeMart Customer Service at 1800-405-0447 for more information. Lowest factory direct price guarantee.